My bookmark feeds don’t have the titles of the bookmarks. Nor link to them. Ones < 280 chars don’t have titles. The RSS templates are not in my theme but in WordPress in wp-includes. I added only one of my own for microcasts and it goes in my theme folder. It is added as a custom feed. I don’t think that the indieweb themes do anything with the RSS. It sounds like you are looking for daring fireball type titles/links? I think there was a plugin for that. BTW I didn’t, yet, get a mention from your post? Since joining micro.blog I’ve been messing around with my blog and its RSS on and off. I had settled on removing the titles for status post RSS feed. This means short status posts (<280 characters) were passed over to micro.blog and displayed the whole content there. Longer posts are truncated and linked. Unfortunately this meant that microblog looks quite ugly sometimes, especially when it posts a truncated indieWeb reaction that includes a quote. So I’ve changed how it works a little to only remove titles from the RSS id there are <280 characters. This is a status post, so hopefully it will show up on Micro.Blog as a linked title. I am finding micro.blog a really interesting community. From an educational POV the most positive experience and the one that I would like to see replicated (in Glow and elsewhere) is #DS106. DS106 influences the way I think about ScotEduBlogs and the way I built two Glow Blogging Bootcamps 1. In particular these sites aggregate participants content but encourage any comments and feedback to go on the originators site. Micro.blog is making me rethink this a little, there you can comment on micro.blog (the same as the blog hub in DS106) and that comment gets sent as a webmention to the originators site. This makes thinks a lot easier to carry through. Micro.blog also provides the equivalent of the #ds106 twitter hashtag but keeps that in the same space as the hub/rss reader. Micro.blog will never be that big. What we need instead of another huge social network is a bunch of smaller platforms that are built on blogs and the open web. Firstly it reinforces how Manton really thinks hard about making micro.blog a brilliant place, avoiding the pitfalls of huge silos. Secondly it speaks to idea of multiple social networks. Imagine if DS106 and ScotEdublogs where both platforms in this sense, I could join in either or both along with others using my blog to publish. I could decide which posts of mine to send to which community, and so on. It is the same idea I’ve had for Glow blogs since I started working with them 2. Class blogs could join in and participate in different projects. It would be easy to start a local or national project and pull together content and conversation from across the web into one learning space. Although I’ve spoken and blogged a lot about this idea I don’t think I’ve made it stick in the minds of many Scottish educators. I wish I could. 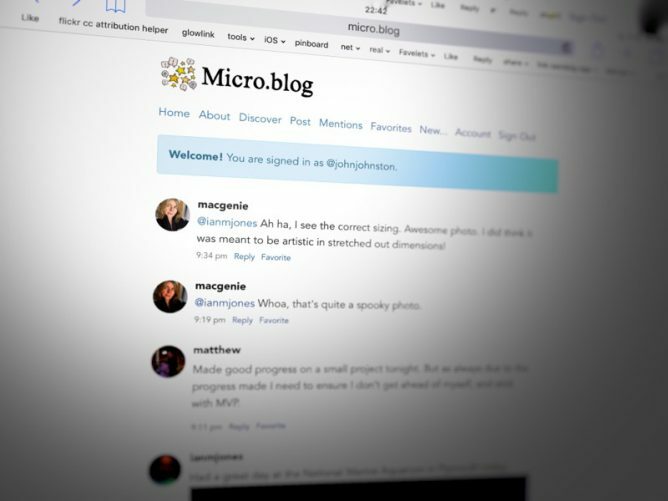 I signed up for the kickstarter of micro.blog, it went live earlier this week. The service is very new and so far has changed and developed every day. The idea is, you publish short posts, these are mirrored on micro.blog/yourusername via RSS. The posts can be from any RSS feed. You can get a micro.blog hosted blog at yourusername.micro.blog or use your own hosting. The micro.blog iOS app will post to your micro.blog blog or your own WordPress blog. Or you can use your own system. There is a microblog bot that will post your posts on to Twitter too. The difference between the hosted blog and your micro.blog/username stream is a mite confusing at the moment. I wonder if a different domain name might have helped. Both the hosted blog and the twitter bot are paid for options. The docs make it clear that you can host your own and point to IFTTT as an alternative to the bot. The system follows the indieweb principle of controlling your own content and sending it on to other spaces. Replies on micro.blog to your posts are sent as webmentions to your own blog and show up as comments if you have the webmention plugin installed. I had that already to get twitter replies as comments. I’ve added a new category here, micro. I’ve edited the blog to not have posts with this category show on the home page, they show on micro instead. I set the micro.blog app to create posts with the status format in the micro category. I turned off the jetpack social posting to Twitter function. I’ll manually post normal posts. I’ve set up a micro.blog bot to post to Twitter. The service is very much a work in progress, and I’ve not really read the docs but I’ve noticed a few interesting things. On is that the posts on micro.blog consist of descriptions with no titles. When you post form the app, you get a post on your blog without a title. A post with a title on your blog is posted as a link to micro.blog. With a post without out a title the description becomes the content of the micro.blog post. That means you get lots of posts listed in your dashboard as ‘no title’. Since I didn’t like this I tried to auto add titles to posts without titles with a little Google-fu and some WordPress coding. This worked out fine, except the posts on micro.blog consist of a title and a link, the tweet posted by the twitter bot is the same. I am now looking to create a custom RSS feed without title. More googling ahead. Alternatively I could use the code from Tweaks for micro.blog that adds dates as titles, micro.blog ignore these. Or just learn to live with ‘no title’ posts in the dashboard. Preparing for the microblog is a lot more coherent than this post if you are looking for setup advice. I’ll post the code I’ve mentioned above at some point, it is pretty simple stuff.